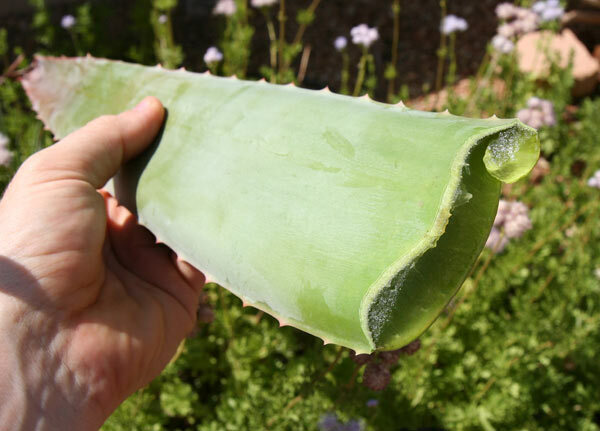 First, start by cutting a large aloe vera leaf from a living plant. Be sure to thank the plant for granting you this nutritious gift, as we should always give thanks to nature for providing us with nourishment and natural medicine. Pick a large aloe vera leaf that's green and thick. The thicker the leaf, the more gel you'll get. 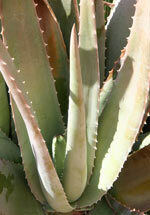 A healthy aloe vera leaf is about the size of your forearm. Always respect the plant and leave enough for the plant to survive and prosper. Never destroy an aloe vera plant to harvest its leaves unless, of course, you're running an aloe vera farm and plan to re-plant it. After cutting the leaf, let the dark red resin drain out by holding the leaf upside for several seconds until the resin drips out. The gel will stay in the leaf, so don't worry about losing gel. Want more PhotoTours like this e-mailed to you when they're available? 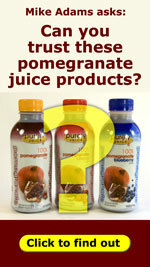 Click here for free e-mail alerts.